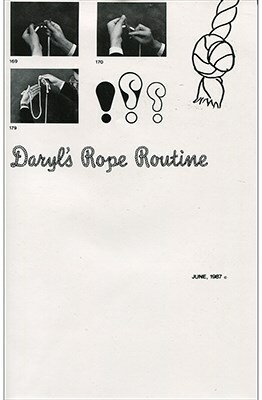 Several successful magicians have told Daryl that they make their full time living performing this one routine alone! A piece of rope is displayed and suddenly the magician pulls off the ends - leaving you with a rope that has no ends - an 'endless loop'! The ends are then placed back onto the rope and everything is back to normal. This certainly grabs the audience's attention... and it is just the beginning! Next the rope is cleanly cut with your fingers (your 'magic' scissors! ), before being magically restored! One at a time, the ends then jump from one side to the other, changing places with the middle of the rope. The rope is now handed out for examination. The second piece of rope is introduced and a small portion is visibly and magically pulled off to be handed out for examination. A knot is slowly tied in the remainder of the rope and then simply vanishes. Instantly and visibly, the knot reappears! This rope is then handed out for examination as well. The three previously examined ropes are now mysteriously stretched until they're all the same size. They are then tied together (to eliminate the use of sleight of hand) and yet whilst securely tied together, they return to their three original different lengths! Everything is once again handed out for examination! This is an extremely practical and commercial routine. It can be performed silently (with music) or with snappy patter, with a 'straight' or a comedy presentation. You are limited only by your imagination! This routine is explained in detail with a 12-page booklet and a full sized poster with 194 photographs!